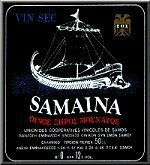 Although, many things have changed since ancient times the type of wine mentioned by the ancient grammarian Hesychius in his Lexicon as "Samian Vine" still remains the same owing to Samos' favorable climate and to the extraordinary qualities of its earth. 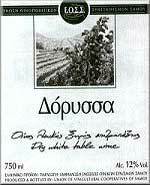 Natural, sweet wine, with the controlled appellation of origin "SAMOS". 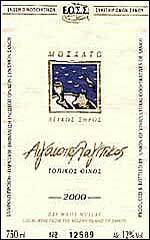 The most noble and fine wine to be found in Greece and possibly in all the vineyards of the world. 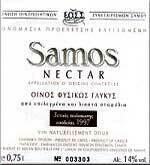 The Samos nectar wine is produced from over-ripe Muscat grapes, hand picked and dried in the sun for several days to develop its high degree of sweetness. The juice of these grapes undergoes natural fermentation to produce NECTAR, a special kind of wine, with its soft taste and aroma and distinctive appearance. It is aged in oak barrels for a period of 3 years. You will enjoy drinking it any time of the day and it is best served with sweets and fruit. 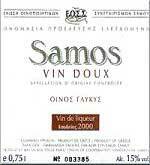 A sweet wine, with the controlled appellation of origin "SAMOS". It is produced from ripe, Muscat aromatic extremely sweet grapes, and has a fruit flavor with the strong magnificent aroma of Muscat grapes. Best served with sweets and fruits. The five years aging of VIN DOUX in oak barrels, is what makes this wine an exquisite one. "Anthemis", is how Samos was called in the ancient years because of the luxuriance of self sown blossoms. 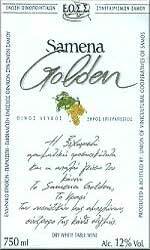 This wine is aged in a special way and is produced with the blessings of the HOLY METROPOLIS OF SAMOS & IKARIA. 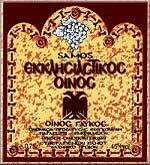 This certificates the tradition, which has existed since the mid-nineteenth century, according to which the Muscat wine of Samos is just like the Holy Communion wine. A sweet natural wine with deep aroma, mellowness and tingling sensation of overripe Muscat grapes, from a selected low limited production. 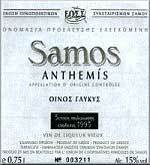 A wine with the controlled appellation of origin "SAMOS". The full flavor of ripe grapes is a good match for all foods. Also served as an aperitif. 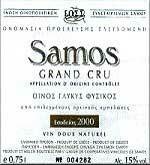 The Samos grand Cru is an essential partner to wild fowl game, red meat in general, sausage or cheese. Dry wine with Muscat aroma. 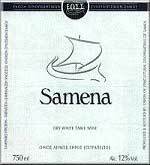 Samena was the name of the ancient triremes of Samos(704BC). They were very fast and had a stem in the shape of a wild boar muzzle. It is a dry white wine made from grapes of special selection. 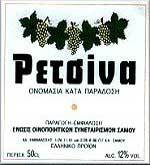 Wine with rare characteristics and a mild aroma of Muscat. Dry white wine with a balanced taste. Dorussa is an ancient name of Samos deriving from the word "spear" because of the fact that Samos was either being well wooded or because it had a strong navy (or probably both). A dry rose table wine. The SELANA rose is produced from a combination of two rare red varieties of wine, the Phochian and the Retinian. The bouquet and traditional feeling of SELANA conquers the senses when served with your favorite cuisine. Dry white wine made from Muscat grapes and scented with resin. Dry wine with Muscat aroma.